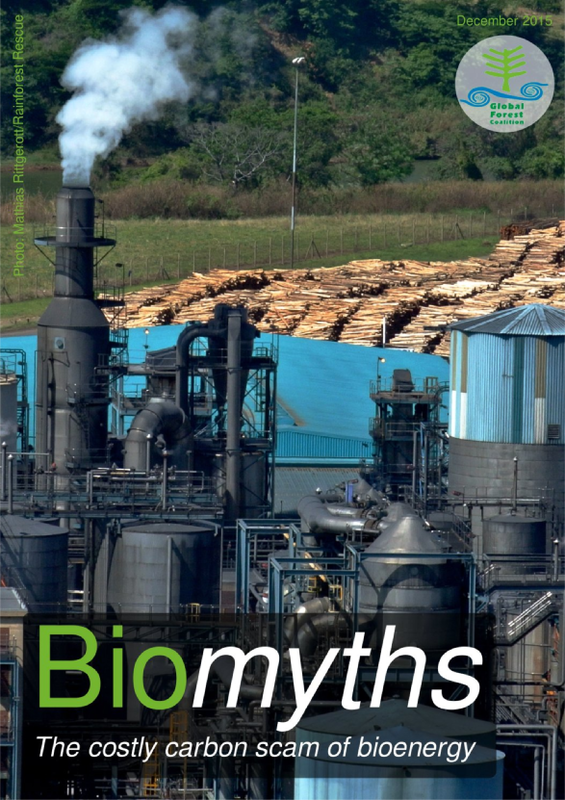 7th December: The Global Forest Coalition  has launched a new report at the Paris climate talks today titled “Biomyths, the Costly Carbon Scam of Bioenergy”. The report exposes how large-scale bioenergy is being promoted as a replacement to some fossil fuels, based on what it calls the myth of its “carbon neutrality”. The “Biomyths” report highlights that in the US and EU, bioenergy now accounts for the largest share of energy classed as renewable. The rapid growth in the industry is being driven by renewable energy targets and financial incentives that are now offered in most countries. The International Energy Agency (IEA) anticipates that total primary bioenergy generation globally could more than triple by 2050,  driven by an increase in industrial-scale heat and power generation. The report provides an overview of current global industrial-scale bioenergy trends. Use and production are primarily in the US, the EU and Russia at present, but other regions such as Asia are gearing up to become heavily engaged in it, predominantly through the production, consumption and trade in industrial-scale wood-based biomass. “Foreign investors are using the bioenergy boom, particularly in the EU, as an excuse for grabbing more land in Africa, South America and Southeast Asia, specifically to produce biomass for energy. We are already facing the detrimental environmental, social and economic impacts of large-scale bioenergy, which include deforestation, biodiversity loss, land grabbing, water contamination, reduced water availability, and the loss of food security and soil fertility.” warns Kureeba David, of the National Association of Professional Environmentalists in Uganda, a member group of the Global Forest Coalition. By mid-2015 164 countries had at least one type of renewable energy target, up from 45 countries in 2005. For example, the EU’s Renewable Energy Target requires at least 20% of energy use to be met from renewable sources by 2020, while the EU’s new Climate and Energy Framework for 2030 includes a target of at least 27% of energy use to be met from renewable sources by 2030.